The Korea Herald is publishing a series of articles scrutinizing key aspects and sectors related to the creative economy the Park Geun-hye government is promoting as a national agenda. The series was made in cooperation with the Ministry of Science, ICT and Future Planning and the Ministry of Trade, Industry and Energy. This is the first part of the series. ― Ed. When President Park Geun-hye introduced her creative economy policy during the election campaign late last year, most people were bewildered by the relatively new concept. The policy’s key points included promoting convergent IT and software technologies, scientific discoveries and technology integrating with cultural content for sustainable economic growth. However, the common link between these policies is that the global economic trends of the time pushed the presidents to devise them. Having been heavily focused on a strategy of “catching up” with advanced economies through traditional manufacturing techniques, Korea needed structural reforms to sustain its economic momentum. Park’s government has delved deeper by tackling the root of its economic problems, and devising policies and measures leaning more on creativity and innovation for sustainability. It furthermore sought to give more economic leverage to start-ups and small and medium enterprises. In contrast to the previous government’s chaebol-friendly policy, Park believed smaller but innovative firms with creative ideas and technologies can truly create more jobs, and boost exports and growth in the long run. The policy for a creative economy could be said to have benchmarked that of the United Kingdom, and be based on the ideas of John Howkins, the author of “The Creative Economy,” according to a report by Kim Joo-hwan, researcher at KB Research, a unit of KB Financial. Australia was first to use the phrase “creative nation” in an economic report in 1994, but it was London’s Department for Culture, Media & Sport that officially drew a strategic map to develop creative industries for sustainable growth in 1998. Although the concept of a creative economy differs between economies, the universal theme is the convergence of technology, creativity and culture. The creative sector worldwide managed to increase exports by 14.4 percent between 2002 and 2008. Its growth accounted for 4.5 percent of Europe’s gross domestic product, and the sector contributed to 3.8 percent of job creation, according to the KB report. 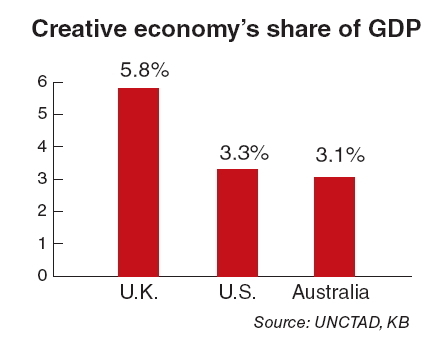 The creative sector in the U.K. accounted for about 6 percent of its GDP in 2010, about 8 percent of its employment, and 4 percent of exports. Park’s vision of a creative economy encompasses more than what the U.K. had set out to do with its economy. The Korean president’s basic strategy is promoting innovative start-ups that can develop and discover new technology with simple ideas, emulating the young entrepreneurial spirit commonly seen in the U.S.’ Silicon Valley and in Israel. However, industry sources said the problem lies with “social perception,” as young Koreans often avoid starting a company or working for SMEs due to high risks, instead seeking stable jobs at conglomerates, whether public or private. This negative perception could dampen government efforts to foster high-risk, high-return ventures, which it sees as one of solutions to creating jobs for the young. So the government intends to establish an ecosystem to support sustainable start-ups and SMEs for technological development. A creative economy, as Deputy Prime Minister and Finance Minister Hyun Oh-seok summed it up, is an ecosystem where entrepreneurs and young people can take risks, secure investments to finance the launch of innovative start-ups and restart businesses even after failure. The government aims to establish an entrepreneurial cycle in which anyone with innovative and creative ideas can launch start-ups and grow by easily securing investments, and investors can retrieve their capital, which can then be used to finance other tech ventures. The so-called venture ecosystem will “bring forth buds in (the Korean) Death Valley,” officials said, referring to Korea’s reputation as a stark, desert-like environment for creative entrepreneurialism. Korea has seen a lackluster flow of investment into start-ups despite efforts to promote the sector over the last 15 years. The government seeks to cast off negative perceptions and other factors that have dragged on the creative venture sector through some 3.3 trillion won ($2.9 billion) in funds to back technology developed by start-ups, as well as to buffer investment losses. “The measures for ventures are aimed at realizing the development of a creative economy, and helping Korea to be a leader rather than a follower (of other economies),” said Hyun. 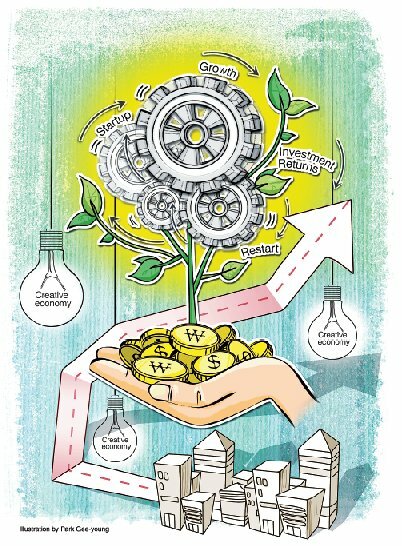 With the establishment of the venture ecosystem, the government expects the start-ups to attract investment worth 10.6 trillion won over the next five years, up from its initial projection of 4.3 trillion won. The measures also included offering tax breaks and incentives to investors and introducing more crowdfunding platforms. The Korea New Exchange was established in July with the aim of further bridging the gap between venture entrepreneurs and investors, and boosting the circulation of capital, to allow start-ups to use the investments for expansion, and investors to retrieve them and reinvest in new, emerging tech companies. Overall, the main purpose of the government’s creative economy policy is to increase job creation and help Korea become a technological leader rather than a follower as it aims to achieve an employment rate of 70 percent in the next four years. The Science and ICT Ministry said it hoped to create about 650,000 jobs through these measures to support innovative industries, and increase its globally professional and creative workforce.